"The Finest Hunting Camp In Canada!" An Ontario Hunting trip with the Outpost Company and Halley's Camps will spoil you for anything else. 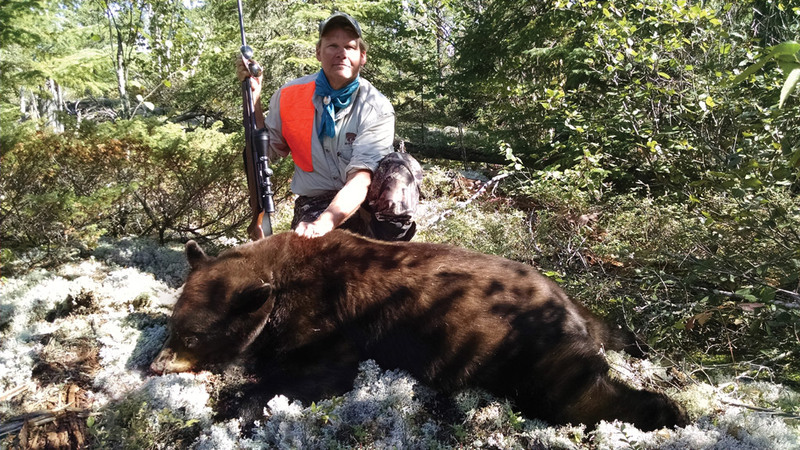 The Outpost Company and Halley's Camps are situated in one of the most pristine hunting locations in Canada, and guests enjoy some of the finest moose hunting, black bear hunting, and whitetail deer hunting trips that Northwestern Ontario has to offer. Our all inclusive, fully guided moose hunts take place at either one of our 12 remote fly-in outposts or at one of two fly-in tent camps. 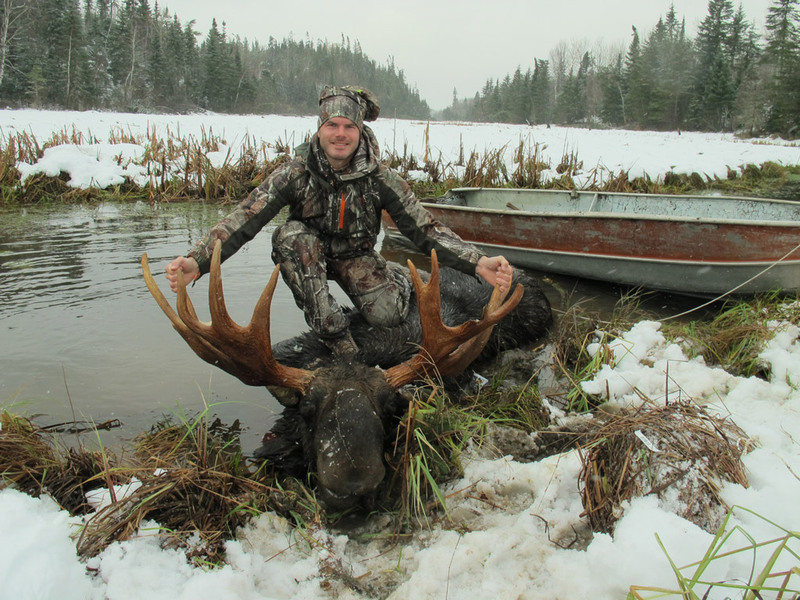 These hunts are in remote locations in some of the most prime moose hunting in Ontario. For our rifle hunt we consistently have a 90% success rate with 50+ inch bulls taken each year. 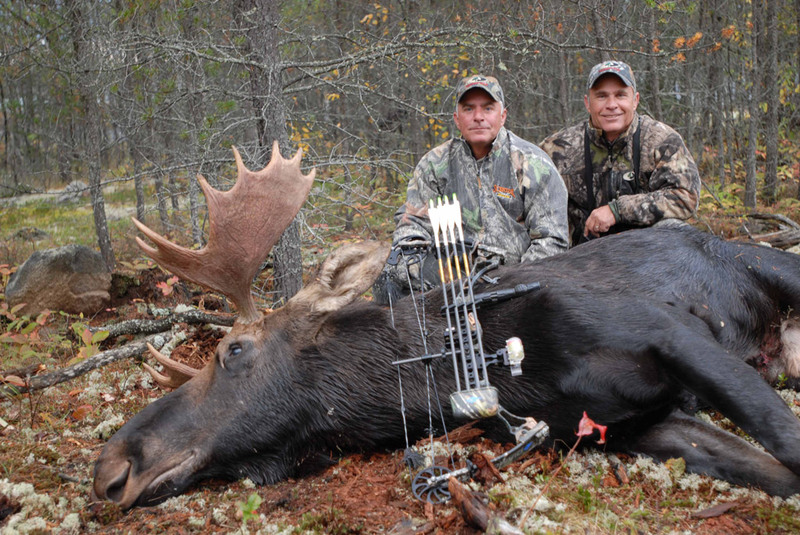 Our largest bull to date was 66+ inches that scored out at 219 7/8 with Boone and Crockett. Calling in a 1400 lb bull with a rack that size will make the hair stand up on the back of the neck of even the most experienced hunter! Archery hunt success rates are obviously somewhat lower than the rifle hunt as even a bull in full rut sometimes can be diffucult to present within shooting range. What you can count on for the archery hunt is that your guide will "talk" to the moose through calling and you will see and hear how these great animals behave during mating season. During your rifle or bow hunt your group will be the only people along with your guide at that outpost. This way, we can give you a vast area to hunt with no one else around. Traveling by boat to set up mainly in meadows and willow swamp and creek areas where moose are regularly feeding, the hunting is done by calling using the natural cover as camouflage. Raised stands are also used at times as well as spot and stalk techniques. Shooting disstances for rifle are typically 50 - 150 yards. For archery we want to get the moose within 50 yards although we discuss with you what kind of range you are comfortable with. The accomodations for your hunt will be second to none. The outpost cabins are fully modern with indoor showers, hot and cold running water, and electric lighting powered by solar energy or a generator. The guides are a very important part of your hunt. They will not only guide you to your chance at a trophy, but also cook and clean and make your hunt unforgettable. 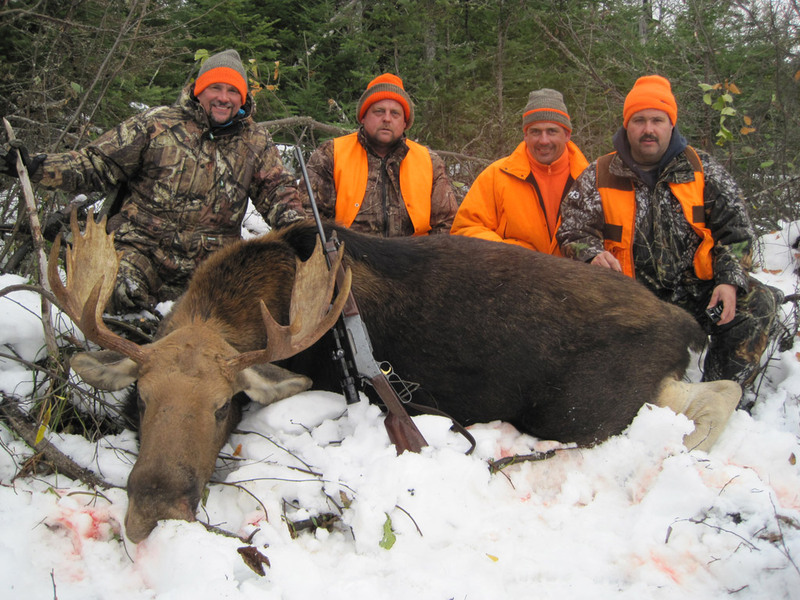 Out guides are very knowledgeable moose hunters, they use their experiences from past hunts to make your hunt something you will want to tell your grand children about. 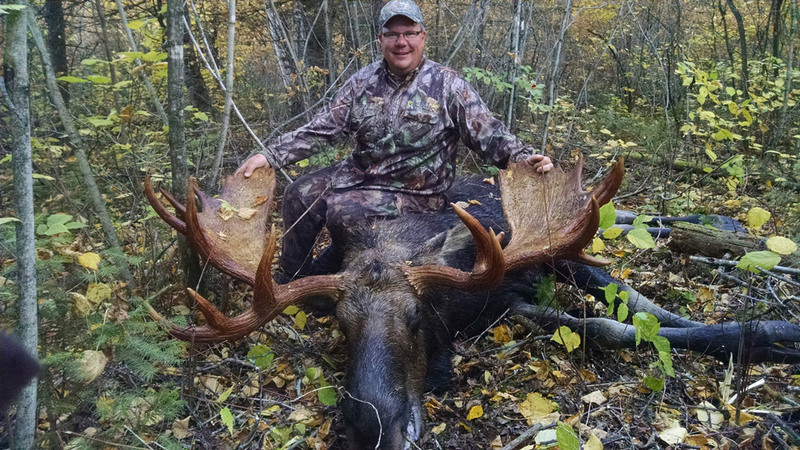 We invite you to also visit our Halley's Camps website for more information on our Moose Hunting trips. 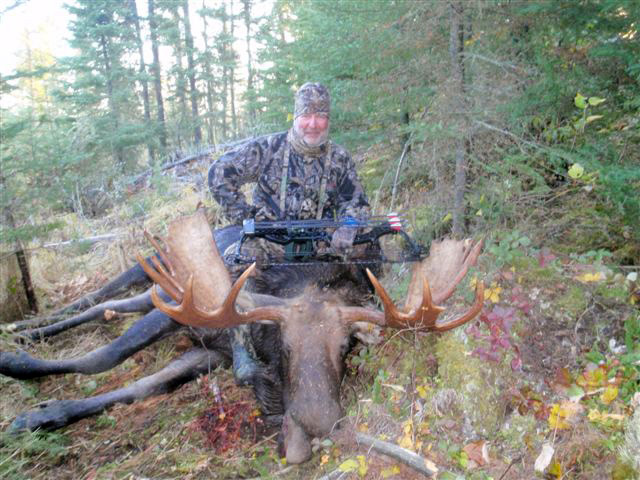 Once there, you can read our moose hunting editorials in our "Catch of the Day" section. With archery becoming very popular in recent years, we have a number of stands in the 15 - 30 yard range. Our rifle stands are generally in the 75 - 100 yard range. We also have a number of portable stands to accomodate changes in wind direction and different comfort levels in shooting distance. 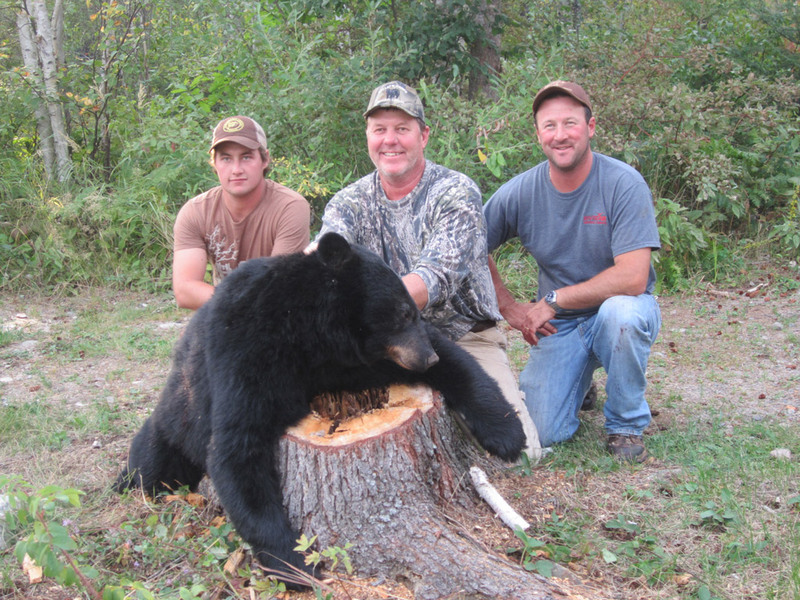 We will work with you to ensure your hunting trip is an enjoyable and memorable one. We invite you to come and experience the exciting bear hunt. 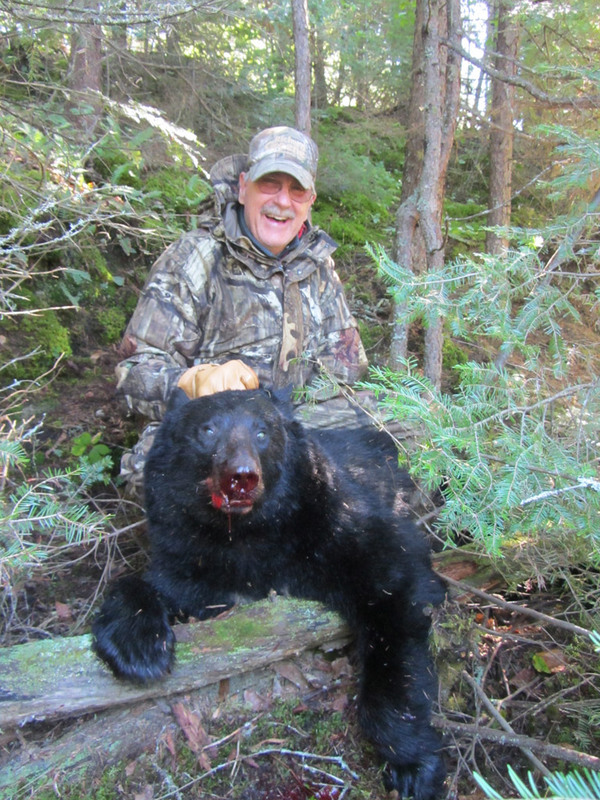 The five day all inclusive bear hunt takes place at either One Man Lake Lodge or at Kettle Falls Lodge. If you choose one of these hunts you can expect to be fully catered to, and all you will need to bring is your personal gear and your weapon of choice, we take care of the rest. The hunting is done on the remote English River system with transportation to the stands done by boat. 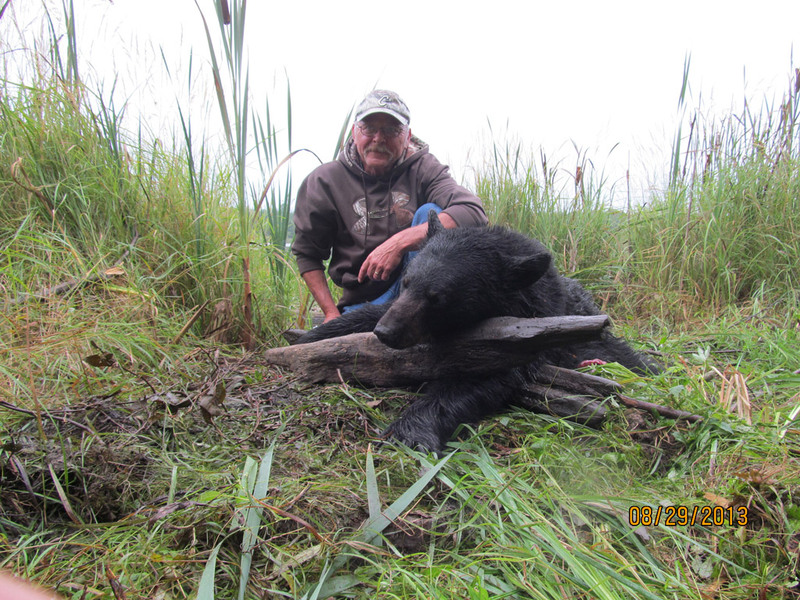 Our experienced guides will assist you with transportation to and from your pre-baited stand, skinning and processing of your harvested animal, and even some fishing during your stay. 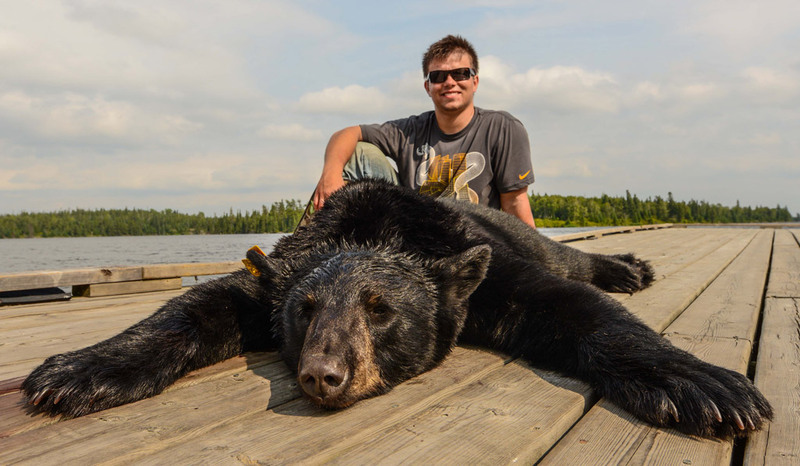 Having a large bear management area allows us to have several pre-baited stands going at once, allowing your guide to choose the bait that will suit your hunting needs and allow you the best chance at a quality Ontario black bear. Your stay at one our beautiful lodges will include daily maid service, all meals, and an unforgettable experience. 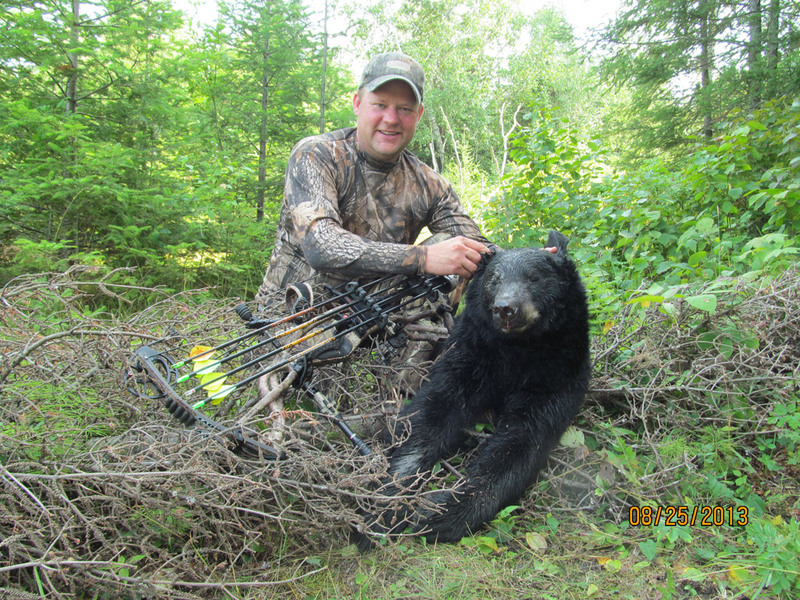 This hunt takes place at our drive in housekeeping camp at Caribou Falls Landing. 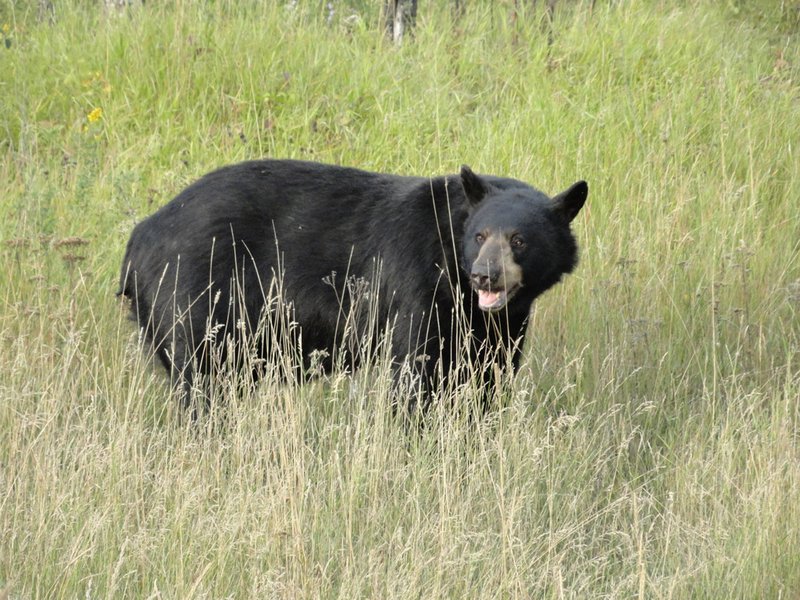 Our exclusive hunting area is rich in blueberry crops and other natural food sources, which makes for a large, plentiful bear population. the use of ATV's on this hunt makes it possible to access very remote areas via old logging roads. You may bring your own ATV, or we will provide transportation to and from the stands. We will have several active baits and stands ready for you upon your arrival. 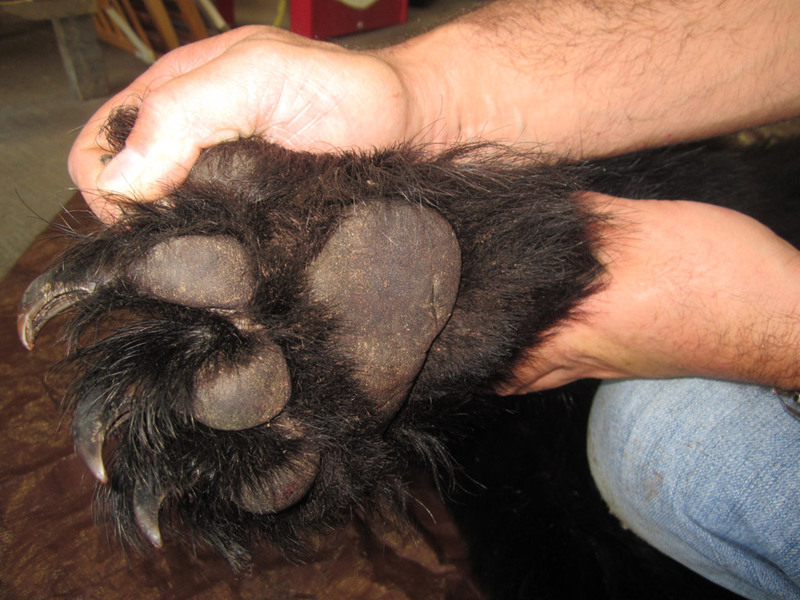 With the bear hunts at our outposts, your food and guide are not included in the package, and pre-baiting is extra. These housekeeping hunts are operated out of a choice location at one of our 12 fly-in only outposts where you are the only ones there. We will give you a good rundown of what it takes to have a successful hunt at your outpost. The accommodations at our outposts are second to none - the outpost cabins are fully modern with indoor showers, hot and cold running water, and electric lighting powered by solar energy or a generator. 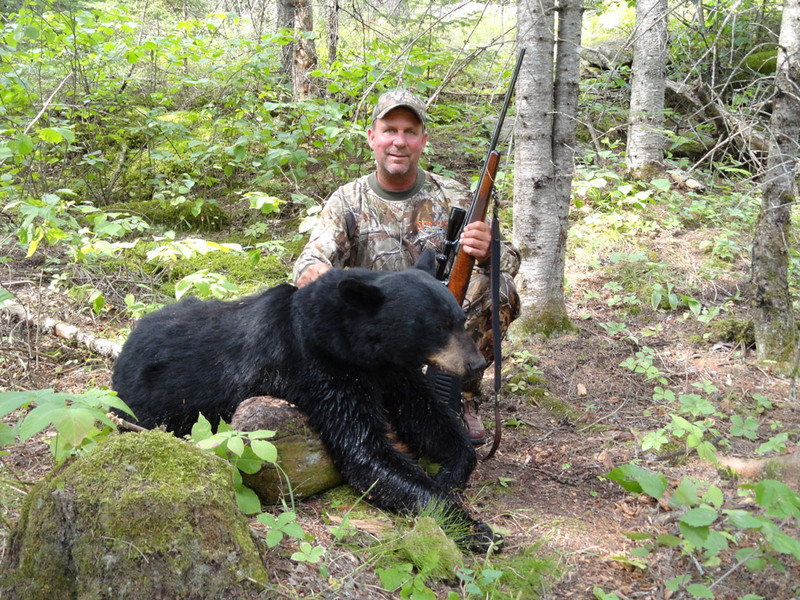 We invite you to also visit our Halley's Camps website for more information on our Bear Hunting trips. All of our deer hunts are located at either Caribou Falls Landing or One Man Lake Lodge on the English River. We invite you to also visit our Halley's Camps website for more information on our Whitetail Deer Hunting trips. Click on any of the photos to see a larger image, or click on the links at the top of this page to go to the Outpost Company's home Web site. Email your Outpost Company hunt photos here!